Sunday afternoon the snow started falling. Sharing a Bible story before bed. Using cinnamon rolls instead of biscuits rolled in cinnamon and sugar made these a quick breakfast. Make Resurrection biscuits with marshmallows. Great, great activity. It opened up a huge discussion. This was the first week of spring break. Megan and I have had so much fun being together. An evening spend dying eggs at my parents. So thankful that the snow is almost gone. It warmed up enough to play on the back porch yesterday. Even with winter hanging on signs of spring are all around. Megan discovered a new way to eat her strawberry and whipped cream. She calls this an ice cream cone. Silly girl! My morning will be spend straightening the house and doing a little cooking for the weekend. I then plan to quiet my heart. Easter is my favorite time of the year. The greatest sacrifice and gift that a person will ever receive. It is such a powerful thing that I can't even put it into words. I am always on the look out for quick and easy lunch ideas. I saw these and thought the kids might enjoy them. I rolled out a can of pizza crust and covered it with sauce. I used half a can of sauce and then cut the dough in half. One section received pepperoni (I used full size since that is what I had) and the other half I added some sausage. Next the string cheese was cut into five pieces and placed along the edge. Then roll the dough up. Now the tricky part is cutting each half of dough into six pieces and not loosing your filling! Each section goes into a greased muffin tin. A little shredded cheese was added to the top and these were baked at 425* for about 15 minutes. I paired this with grapes, peas and carrots for a yummy and super easy lunch! I have struggled a little with getting my spring things out. The calendar says spring but I think Mother Nature forgot it starts today. I know that soon it will be here. I will keep telling myself that anyway! I made this banner based on this. I had forgotten all about it until I saw another blogger mention it. I spent lots of time in the kitchen and it puts my thoughts into perspective every time I look at it. I came back later and tucked a couple of wooden bunnies in the window sill. I hope to put a couple of pansies into the empty pots. Making the crosses was a spur of the moment thing. Chuck likes them so much that I think I will find a permanent home for them later. The simplest thing is also one of my favorite things. Megan loves window clinks and we placed a row of flowers on the bottom of the living room window. Each time I look out the window I see them over the edge of the couch and it makes me smile. Welcome Spring! I am looking to enjoying so many things you have to offer! Typical March weather warm enough to be outside one day and then cold enough for ice the next. Making my own fabric softener. I have used it twice and will let you know what I think after a few more loads. Megan loves to butter the bread to go with spaghetti. The boys have been enjoying the cars this week. It is a joy to see Eli get to the stage where he is engaged for longer and longer periods of time. A huge thank you to everyone for their kind comments on my chat with Tammy. I am looking forward to getting to know some new friends! 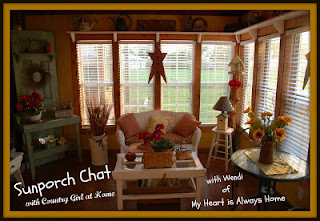 I had the opportunity to sit and chat with Tammy from Country Girl at Home. Stop by for a brownie and a cup of tea and join the chat with us. Be sure to poke around while you're there. You'll fall in love as she shares her simple values, love for family and yummy meals cooked on her gorgeous stove. She has a great eye for decorating and you'll especially enjoy the projects her handy husband completes. May your day be filled with joy ant contentment! I purchased a picture frame recently and before I could use it I broke the glass. I could have purchased a new piece of glass, but it was an inexpensive frame and that would have cost more then I had spent to begin with. I stewed about it for a while and then had the idea to use it to pretty up my menu area. This is what the area previously looked like. Functional but not at all pretty. I put the frame up and got a general idea of the inside area of the frame and then taped it off. I dug out the can of chalkboard paint and got busy. I used Velcro to attach the frame to the door. The menu would only take up about half of this space. I then needed to decide how to use the bottom half. I thought about using it for a to do list or for listing shopping items. In the end I decided to write a scripture. I ended up choosing Matthew 4:4. I used a chalkboard marker from Hobby Lobby. An indulgence that I have never regretted! After seeing how pretty it looked I was on the search for an attractive menu calendar. If you are interested I got my menu here. It is 8x11 standard if you print it. I saved it and put it into my Hallmark card making program so that I could change it to print landscape.